There is nothing funny or entertaining about cancer. Having dealt with it in my personal life way too many times, I have always said that 100 years from now, people will look back at the way we treat cancer today and say it was as barbaric as we now think of bleeding or leeching. However, Carol Piersol in partnership with Virginia Repertory Theater has proved my initial theory wrong with the production of Breast in Show at Willow Lawn. 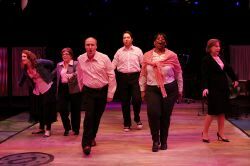 Maupin directs a cast of six: Andrew Hamm, Brittany D. Simmons, Chloe Williams, Jeanie Rule, Lauren Leinhaas-Cook, and Russell Rowland, who play multiple roles in this unique musical comedy. 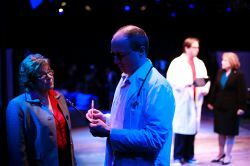 The focus of the show is four cancer patients and their families, friends and doctors. The songs and dialogue manage to intertwine entertainment with facts about breast cancer, and the emotions felt by the patients and their families. A live three-piece band performs under the musical direction of Kim Fox. Maupin uses the stage space well. Choreography by Jennifer Hammond is simple and effective. However, with the audience seated on three sides, occasionally the choreography and blocking leave some sections only seeing people’s backs. Lynne M. Hartman’s lights add a great touch in setting the mood of many of the musical numbers, with gentle hues of pink or vibrant reds. Nikki Wraggs costumes help establish the various characters each actor performs. Among the numbers is one where the doctors repeatedly sing “blah, blah, blah” as that is all the patients are hearing with all the medical jargon. A unique dance number has the patients moving around in chairs on wheels attached to IV poles on wheels. 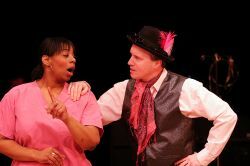 One patient poignantly says “can you repeat that in English?” Andrew Hamm is humorous as an extraverted wig salesman. Another humorous number has Jeanie Rule flirting with her oncologist ala Blanche Devereaux from “Golden Girls.” Chloe Williams also stands out in a number with a flirtatious and vivacious cancer cell. Brittany D. Simmons has one of the most touching songs towards the end of show, a soft and sweet number, later expanded upon by the rest of the cast, about wanting more time. But time is running out to catch this important work — the show runs one more weekend. As was evidenced by the number of audience members weeping and hugging at the end, it will be well worth your time! This article can be linked to as: http://showbizradio.com/go/9282.